Summer-fresh blueberries and tangy yogurt pair up for this frosty favorite. Light and refreshing, it makes a delightful dessert for casual summer chilling out in your own backyard. With the temperature soaring to almost 90F over the weekend, Blueberry Lassi was a nice sweet chiller . Blueberries add some natural sweetness and can be enjoyed just by eating them alone or as a combination with other fruits or yogurt. This makes them great additions to Lassi/smoothie, not only for taste but for the great health benefits as well. With a high level of antioxidants and other nutrients, blueberries can help in anti-aging, cancer prevention, preventing urinary tract infection, vision health, and helping in the prevention or fighting of other diseases as well. 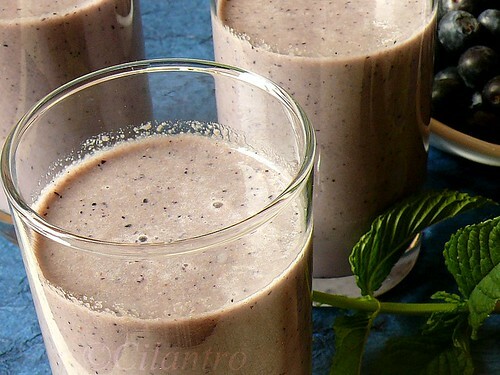 Blend 1 cup of blueberries, 1/4 cup of homemade yogurt and 1/4 cup of milk together until well blended. Serve chilled into glasses. Adjust sugar if needed. Looks good ......haven't tried making lassi with blueberries. Oh Delicious.. Blueberries are soooo gooood! Nutrition packed lassi! Sound great! Yougurt and blueberries...so healthy! Looks great! Yummy,thats a glass full of a yummy lassi! drool worthy!! plz dont tempt me with blueberries.. I dont get them here...love them simply.. Such a perfect drink for Summers! Looks pretty good. I have tried strawberry lassi before, but hesitated trying blueberries for the fear that they might be tart. sounds nice.. what are blue berries called in hindi? can we substitute the recipe with any other fruit? I think it is called falsa. I am not sure though.